Product #55695 | SKU AD3U1600W8G11-2 | 0.0 (no ratings yet) Thanks for your rating! Designed and engineered to support the ever more rigorous requirements of enthusiasts and professionals. 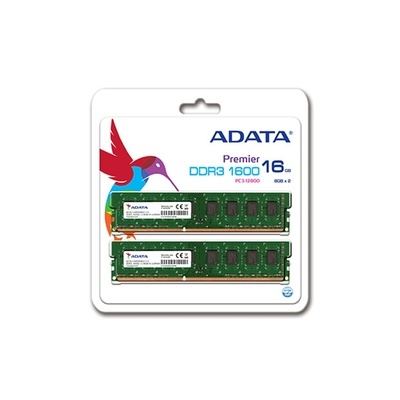 ADATA continues to lead the industry in DRAM timing and density with these ADATA 8GB DDR3 1600MHz Unbuffered DIMM Desktop RAM Dual Module Kit (2 x 8GB). They are designed and engineered to support the ever more rigorous requirements of enthusiasts and professionals. The high 8 GB density overcomes situations where there are only a few DRAM slots on the motherboard, allowing users to maximize system potential and performance.